Northern Belle provides the perfect setting for an occasion as special as an anniversary. Re-live the golden years with your partner on the Northern Belle and make a special day truly memorable. Reaching a milestone wedding anniversary is an exciting time and what better way to celebrate with your loved one than on the Northern Belle. 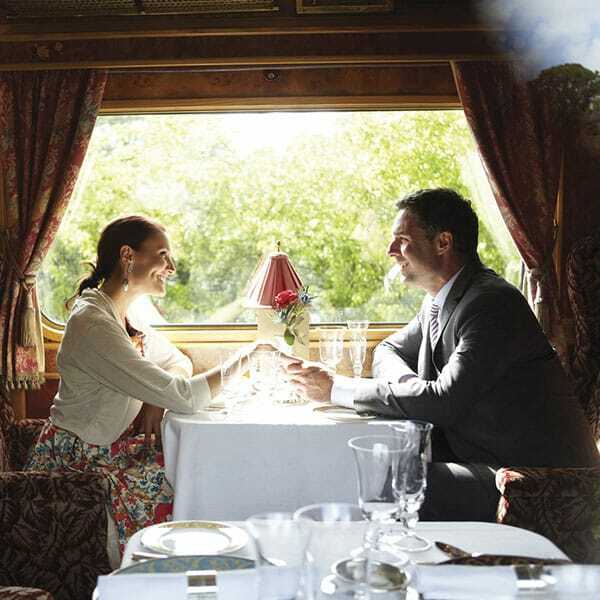 The train is an opulent destination in itself, offering world-class cuisine and service in a truly indulgent setting. Departing from regional stations throughout the UK, guests can choose from exclusive dining experiences or trips to cities and castles, all whilst travelling in ultimate luxury. An anniversary should be a celebration of the years you have spent with your loved one, each one unique and full of memories. Whether it is your first anniversary or a real milestone such as a silver, ruby, golden or diamond anniversary, add another memory of a lifetime by travelling in style on the Northern Belle. To make your anniversary celebrations extra special, choose from a range of gifts to present to your loved one, such as flowers and champagne. Explore our signature collection of beautiful and bespoke gifts. Hand picked with lovingly care our selection of stunning jewellery, delicious confectionery and stylish homeware makes the perfect present to treat your partner on this significant day.